The second half of the year has been released for the Chronodex by Patrick Ng. There is still a place for journalling using a pen rather than a blog post as discussed here No Batteries Required: My Personal Journal. I am now on my 17th Journal and still going strong. I have blogged several times now about Pen Based Productivity Tools and a particular favourite is still the Chronodex by Patrick Ng. Its good to see the 2016 Chronodex released for Jan to Jun 2016, but also a Chronodex Daily Scheduler and GTD To-do List option. This is primarily meant for the Midori Traveller Notebook system, but can be used without. There is still a place for journalling using a pen rather than a blog post as discussed here No Batteries Required: My Personal Journal. I’m now on Journal 16 as an update since that post. I have blogged about the Chronodex a couple of times now as a Pen based Productivity Tool. This tool has now been enhanced and developed further into a Daily Scheduler and GTD (Get Things Done) Pen based tool. Whilst nothing new in realms of GTD Tools, this is for the Midori Travellers Notebook for those who prefer a paper based “thing” opposed to an electronic “thing” and sets out an easy to use daily page. It can be used in a standalone version if a Midori is not owned. If you have been using The Chronodex (I blogged about this back in January) you will soon be coming to the end of the 6 months in the tool. Patrick Ng has now released the next part for the second half of the year. The format of the Chronodex is meant for the Midori Traveller Notebook style of (http://www.midori-japan.co.jp/tr/english/) but you don’t need one of these to use it. Upon first glance it looks a bit quirky and hard to use, but once you get used to the format of the Chronodex it does become an interesting tool to use. A bit different from a normal day to a page diary with times down the side. Using shading, colours or other types of marking you can block out parts of the Chronodex for tasks/appointments and add keys or words alongside the areas filled out. Lunch? No I’ve got a meeting! A recent study from the University of Toronto looked at Restorative Lunch Breaks and the effect of having a good relaxing lunch break on employees. The study found that relaxing activities during lunch, freely-chosen by workers, led to the least amount of reported fatigue at the end of the day. Getting work done resulted in employees appearing more tired, but that effect was reduced when employees felt it was their decision.Socializing, however, also led to higher levels of fatigue; something the paper says has to do with whether workers feel free to decide if they want to socialize and who they’re socializing with. Bupa state that “UK companies are losing close to £50 million a day in lost productivity as workers fail to take a lunch break”. Bupa also point out that the levels of productivity plummet in the afternoon if no lunch break is taken. A similar finding to the University of Toronto. The UK Government state that “Workers have the right to one uninterrupted 20 minute rest break during their working day (this could be a tea or lunch break), if they work more than 6 hours a day.” But how many workers are actually doing this? To get around this I have block booked a whole year of Lunch Breaks in my diary to try and reclaim sometime around Lunch to disengage and get away from the keyboard. An ambitious move! time will tell if it works. The challenge to this approach though is that people booking slots into your diary do not often use the booking tools to identify a free/busy time and book it because they are free at that time. 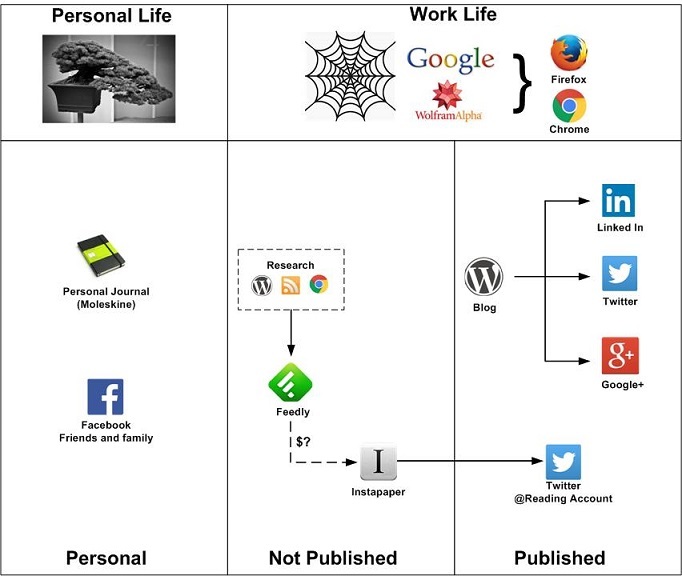 After reading a blog by Stu Downes on “My Personal Knowledge Management Systems“, I have created my own knowledge management system to collect, sort and store useful artifacts, blogs, articles and bits I find on the web. I am using this to collect the stories from blogs and web sites I regularly ready. A good tip picked up in the office today from a colleague. This allows you to scan the articles in a few minutes on a single screen without going via multiple sites. Using a series of key strokes you can read the headlines, then move down the articles, opening each one on the screen if you so wish. Speedy blog scanning here I come. I am using Instapaper to store the articles that I lie. Ive not gone as far as linking Feedly to Instapaper yet as I am just starting out with this combination and cant really justify the $5 a month ($45 year) for the Feedly premium version that allows the links to be created. Will see how useful it would be. So at the moment it will be a manual solution, whilst I work out its value. Yes I could have done a link from Instapaper to my normal Twitter account, however I decided to keep this separate as too many apps wanting links into things does present possible security risks at some point. Also I thought @HemingwayReads was akin to “Being Ernest” – yes a play on words. 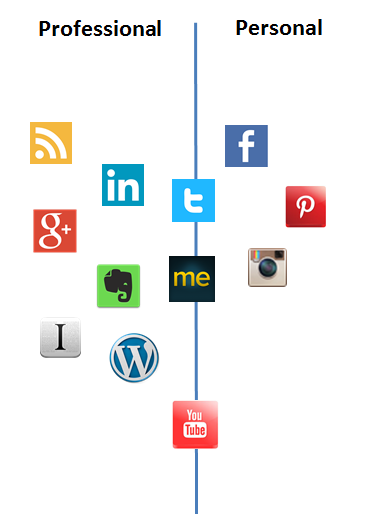 My blog site publishes posts to other apps that I am use such as LinkedIn and G+. Over time my system will develop but works for me at the moment. Back on the subject of paper based tools today as one of the tools that I use has just had its 2015 release – the Chronodex by Patrick Ng. This is released in two halves and is available as a download for the first half of 2015. (You will need a printer after downloading and some assembly). 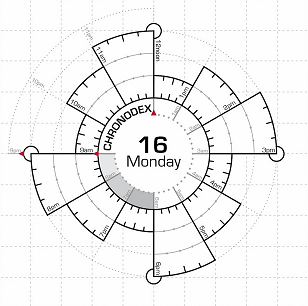 Available to download from http://scription.typepad.com/blog/2015/01/chronodex-weekly-planner-jan-jun-2015-released.html More detailed instructions for use are available on Patricks blog. There are lot of other versions/sizes of the Chronodex available via all good search engines.